Everyone learns better when they are in a comfortable setting and that includes humans and animals alike. Today, with the Internet, people are earning college degrees at home without ever leaving the house. It’s convenient and it promotes learning–and that’s why people are taking online classes in big numbers. At John Van Olden Professional Dog Training, we have not yet developed online training classes for dogs, because they don’t know yet how to use the mouse. But, we are huge proponents of in-home training, because over the years we have seen exemplary results, as well as happy dogs and owners who are still in a great place years later. We offer our program in a variety of cities and states throughout the United States too! A dog’s behavioral issues are directly related to the connection between the dog and its family members, including their owners, roommates, children and any other pets that reside there. In-home training alleviates a lot of anxiety, stress and nervousness. By bypassing all that unnecessary drama, John Van Olden Professional Dog Training can thereby spend all of their time on properly training your dog. By stripping out all of the distractions, such as car noise, people talking, bicyclists and other dogs, for example, both the dog and the trainer (as well as the owner) can focus more intently on what’s important–training! What types of behavioral problems do we often suggest in-home training for? Disobedience: If your dog won’t “come”, “sit”, or “stay”, and even correcting things like running away or towards people or things. Aggression: Human and dog aggression, possessiveness and other related issues. Anxiety: Restlessness, fearfulness, separation, hyperactivity, nervousness. Puppy training: potty training, learning basic commands, leash walking. Multi-pet household: Living in harmony with other animals and other dogs, training more than one dog at simultaneously. 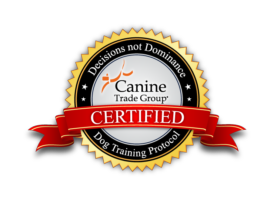 By allowing us at John Van Olden Professional Dog Training to embark on a schedule of in-home training, you are giving yourself and your dog the best chance at living and loving together, happily and with mutual respect. As much as we love our dogs, permitting particular behaviors to continue can produce an environment that is not conducive to a healthy and happy relationship between owners and even other pets, as well as with human guests. If you are reluctant for any reason about beginning in-home training, we can assure you that getting over “the hard part” will be more than worth your time once you see and sense that your dog is learning and building a better relationship with you. Give us a call at 800.649.7297 to learn more!